Monday morning when I rolled over to turn off my alarm, I noticed the radiance of the Super Moon filtering through the slats of my shutters. Since I am an early riser (4:30 a.m.), I am blessed to witness of the dawning of the day—some days more extraordinary than others. This morning was particularly memorable. As I looked out my window, I savored the sacred scene—a glorious full moon, the outline of the Rocky Mountains in the distance, and a world illuminated by a heavenly light. It was literally breath taking! But perhaps the moment is better described as life giving—life giving because the moment filled me with hope. I was reminded that even during the darkest times of our lives, hope illuminates the path that leads to brighter days. This was one of many hope-FULL messages I received over the past few days—messages I feel compelled to share since there is a pervasive sense of despair in the world today. A weariness can be seen, heard, and felt at every turn. Tune into the news. Check your emails. Listen to the chatter at your local coffee shop. The conversations are anything but light and airy! Furthermore, the dark discourse serves to diminish and to drain all those exposed to the dialogue. So today, let’s have a different conversation. Instead of obsessing on our darkest fears, let’s highlight the moments, the people, and the stories that give us HOPE! I presented a keynote address at a national conference this past weekend. Those attending were professional caregivers—individuals who serve families that are dealing with very complex, often heart-breaking situations. After the presentation, I had the opportunity to meet many of the people in attendance and to hear their stories of triumph and tragedy—professional as well as personal. Committed. Courageous. Faithful. Inspired. Determined. Compassionate. Amazing people, one and all. To say I was inspired is an understatement! I left that conference feeling hope-FULL because there are such loving and caring people in this world. Later that day, I was blessed to share a lovely meal with some new acquaintances— people who exemplify hope by the way they choose to live. As we enjoyed a delicious meal, stories were shared and friendships were forged. Without exception, every person at the table had suffered significant challenges over the course of a lifetime—death, divorce, financial hardship, Parkinson’s disease, cancer, war, etc. However, despite the hardships (or perhaps because of the hardships), everyone at the table remained hope-FULL about the future. One woman at the dinner shared that she and her family had endured the incessant bombing raids inflicted on London during WWII. She remembered huddling in the bomb shelters night after night as a young child. She recalled the sights, the sounds, and the smells. She also revealed that up until last year, she had been afraid of the dark because of that childhood experience. It matters not how long it took this woman to conquer her fear of darkness. What matters is that she ultimately did! As I listened to her amazing story, I witnessed “hope” oozing from every pore of her body. I marveled at the light emanating from her eyes. And I gave thanks that our paths had crossed and that I had been blessed by this woman’s hope-FULL story. 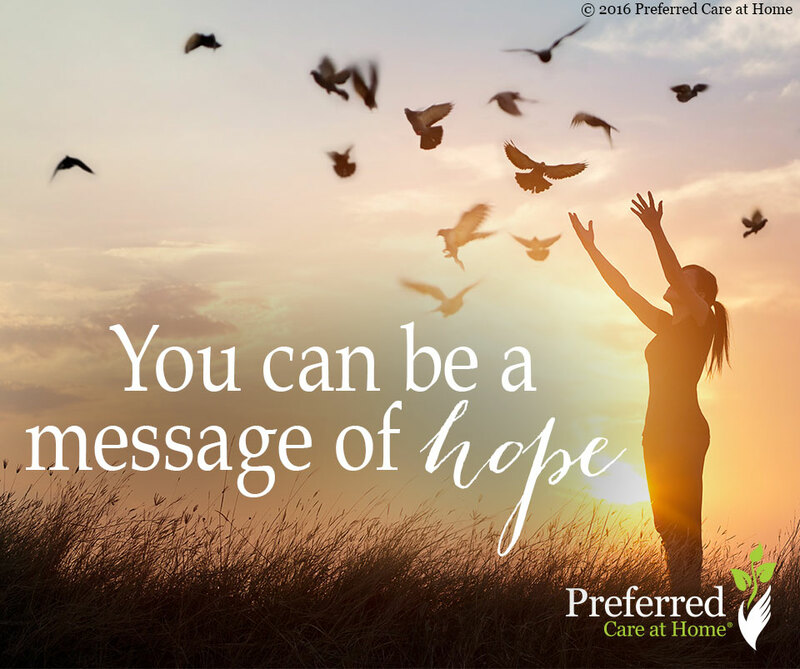 Today, I invite you to be receptive to hope-FULL messages and to hope-FULL messengers. Look to nature, to family, to friends, to strangers, to critters—hope is delivered in a variety of ways and a myriad of forms. Additionally, realize that YOU can be a message of hope to someone who desperately needs to lighten their load or to see a light in their darkness. Do not allow the current cultural malaise to dim the light you have to offer to the world. Be counter-cultural! Choose to SHINE! The world is hungry for hope-FULL messages and messengers.